THE FILM PATROL: ‘The Ballad of Buster Scruggs’ and ‘The Rider’: will the Real West please stand up? ‘The Ballad of Buster Scruggs’ and ‘The Rider’: will the Real West please stand up? You can’t keep a good genre down. Just last year, two horror films, The Shape of Water and Get Out, vied for Best Picture. (Hollywood is normally allergic to honoring horror films — call them horror-‘inflected’? Horror-‘infused’?) Two of the most striking films of 2018 are Westerns, and as far apart in approach as you are likely to find. 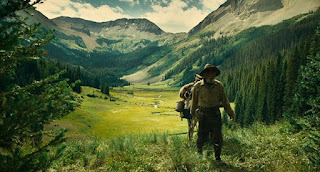 The Coen Brothers’ The Ballad of Buster Scruggs is a six-part, rambling series of shaggy-dog stories in the Style Coen, affected, winking, and baroque. Chloe Zhao’s The Rider is a low-key, documentary-style fiction, set here and now, using non-actors in a narrative evoked by their true experiences. One’s amusing, the other’s affecting. Both will send traditionalists screaming into the streets. The Ballad of Buster Scruggs is an aggregation of shorter films ranging about 20 minutes in length each — pretty close to television-episode length, although the filmmakers assert that the scripts worked out their times organically. Now, the most important thing about discussing a Coen Brothers film is not to think about it too hard. Many critics have jiu-jitsued themselves into knots trying to analyze, interpret, and otherwise create conceptual cages for them. It is supposed to be fun, and their fancies first and foremost do transform the Western into a landscape as unfamiliar as the subject of an exotic travelogue, giving newcomers and old hands both some things to think about. The directors bring an intimate knowledge and love of filmmaking and film history to every project, and part of the fun of watching their movies is spotting the homage, getting the inside joke. There is a rich vein of movie-Western ore to be assayed here. A love of recreating powerful film sequences in the genre that read like dreams is the film’s greatest strength and its greatest weakness, for the stories themselves tear apart and dissipate like clouds on a windy day. 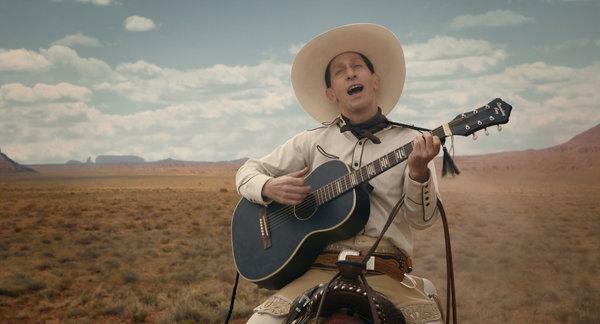 At its worst, Buster Scruggs plays Cowboys and Indians. Most specifically, the Coens are ghosting through other styles, inhabiting some of cinema’s and fiction’s approaches to understanding the American West. (All these styles, ironically or not, are firmly from the pioneer perspective.) The first sequence crash-lands the singing-cowboy Western of the 1930s and -40s; the second has the dirty kinesis of a Leone spaghetti Western. A huge part of the next three tales is their reliance on the stiff, earnest Victorian dialogue stuffed into the mouths of the characters, in the style of American adventure writers from James Fenimore Cooper through Bret Harte, Owen Wister, Max Brand, and the like. A Poe-esque coda concludes. The only thing all the stories have in common is the presence of death, presented as a nearly unavoidable commonplace. The dark stain of that funeral potential lurking in every frame sustains the suspense in the stories, and colors their humor. Where a well-aimed arrow or a misaimed cough could put you underground in a matter of hours, life is both more profound and more provisional. 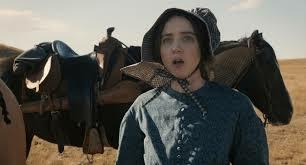 Zoe Kazan in 'The Gal Who Got Rattled' section of 'Scruggs' -- death as punchline. The first sequence, “The Ballad of Buster Scruggs,” is an immediate leap into lunacy, as Tim Blake Nelson appears out of nowhere, singing and talking to the camera as the cheerful and tuneful outlaw Buster Scruggs. (In his all-white outfit, he resembles both Gene Autry and the hero of Bugs Bunny Rides Again.) His nerdy sincerity and confidence makes him an object of scorn, but not for long, due to his six-gun prowess. Incidentally, he’s a preening smartass as well. His random opponents exist merely to make him look good, and he can destroy a man and then make fun of him in an impromptu Hollywood song and dance number. It’s a fun idea, but it kind of runs out of gas quickly. This is a problem throughout the stories — great standalone ideas play out, but they fail to sustain or connect. It’s one bravura sequence after another. When he meets another musical vaquero, the inevitable duet of death acts itself out. “Near Algodones” is an exercise in style in which yet another Coen protagonist is the plaything of fate. James Franco as Cowboy robbing Stephen Root’s Teller and the subsequent absurd permutations of the Cowboy’s fate is a demolition-derby smash of archetypes, none of them registering long enough to engage identification. Is this some kind of Brechtian alienation technique, one that forces us to disengage emotionally in order to engage intellectually, and deconstruct and analyze the genre’s assumptions? You see what I mean about overthinking all of this? The most unpleasant story in the bunch, “Meal Ticket,” describes the existence of a performer with emotional accuracy — by way of Tod Browning’s Freaks. A limbless orator dubbed The Artist (Harry Melling) recites classic poetry and speech for the unwashed masses on the frontier, towed around in a ramshackle wagon by Liam Neeson, aka The Impresario. Get it? Spoiler alert: When sold on the superior profitability of owning a performing mathematical chicken, The Artist finds himself superfluous. Who doesn’t want to see Tom Waits as Gabby Hayes? In “All Gold Canyon,” he gets to play a colorful ol’ prospector who finally strikes it rich. The real glory of this story is pristine setting of the high mountain valley it takes place in; it is not CGI’d. I’ve been there. And no, I’m not going to tell you where it is. Here the most important tension is that borne by every pioneer — between the obvious love for the glorious beauty of the unspoiled wilderness and the desire to dig treasure out of its guts, ruining it forever. In the last two stories, “The Gal Who Got Rattled” and “The Mortal Remains,” we are again thrown into the maw of death and uncertainty, to the point that when a sweeping, breathtaking panoramic shot of a wagon train, 15 of them hand-built for the movie by production designer Jess Gonchor and staff, all I wondered was how many smaller movies might be funded with that shot’s accrued costs. In all these stories, death runs rampant, and the stories’ protagonists turn out to be those who are alive at the end. This is a recurrent Coen theme — short-circuiting the audience’s sympathies and pulling the rug out from under characters for any reason or no reason at all. Behind all the craftsmanship and style is the grim humor of chaos and death. It’s a nihilism that the Coens share with Tarentino, another stylist who plays with genre and makes choices for effect that don’t support the narrative. This is top-down, by-the-storyboard filmmaking, and after a while, despite the beautiful pictures, it all gets too precious and contrived, bloody but bloodless, the West as curio under glass. The Rider is a great film, hands down, and it speaks more to the myths and tragedies of the West than any film I can remember. Its genesis was the interaction of filmmaker Zhao and Brady Jandreu, a Lakota Sioux cowboy and bronc rider she consulted during the making of her first feature film, Songs My Brothers Taught Me. A head injury in the arena took Jandreu out of competition, and the challenge to his way of thinking and way of life fuel the resulting fictionalization. The actors are non-actors, but this is not a lifeless re-creation of some documentary event. Somehow, giving imaginative wiggle room allows the story to reach a searing emotional level. In the film, Brady struggles with the injury’s assault on his abilities, learning that he has to give up riding or die. On his South Dakota reservation, there’s not much to do outside of ranching. Brady finds himself stocking shelves in a drug store. He never voices his humiliation, but it’s palpable. His loyal visits to a friend permanently disabled by just the same injury gives him a graphic picture of what his life might be like. This subtle lead performance is mirrored stylistically in Nathen Halpern’s gentle, hypnotic score. Brady’s callous father battles him, and his autistic sister bucks him up. If there is a romantic relationship in the film, it’s Brady’s with horses. A long sequence in a corral highlights Brady’s way of gentling a wild horse; it’s a revelation about a deeply feeling, empathic, and nurturing capacity that, frankly, I’ve never seen a man demonstrate on film before. It made me cry. 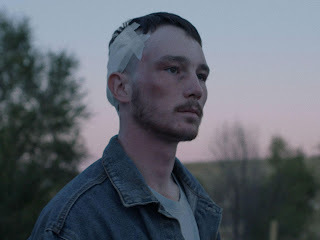 The camera loves the barren, tawny, rolling Dakota hills as much as Brady does, and it instills the viewer with the same unsentimental, raw love of the land for its own sake that grounds real Westerns. Frustrated beyond belief, Brady contemplates competing in the rodeo again. As in Aronofsky’s The Wrestler, the protagonist has to choose between evolving and dying, and there are echoes of Nicholas Ray’s The Lusty Men as well. Poor wombless men! We are possessed of the strange compulsion to test ourselves again and again, usually by hurting ourselves and others. What happens to a male when he can longer fight the fight he wants to fight? If he is forced to settle for less, is he less? Or he is more? Can he submit to the wayward and unknowable will of God? These are great questions that need to be asked. The Western is a masculine genre, a lens through which we sort out our identities. The Western movie still lives, because we are still sorting it out. Scruggs runs roughshod but Rider gets farther using a steady canter.